Hollywood Boulevard – In recent years the Hollywood Boulevard area has been really spruced up. 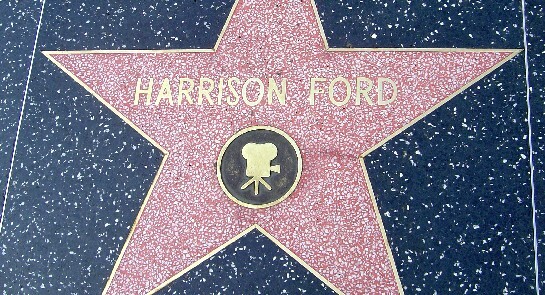 Take a walk along the street to see the pavement stars, known as the “Walk of Fame”. They run from Gower Avenue to Le Brea Avenue and you’ll also find some on Vine Street. The centre piece now of this area is the Kodak Theatre where the Oscar’s take place each year. It’s also surrounded by shops and restaurants. 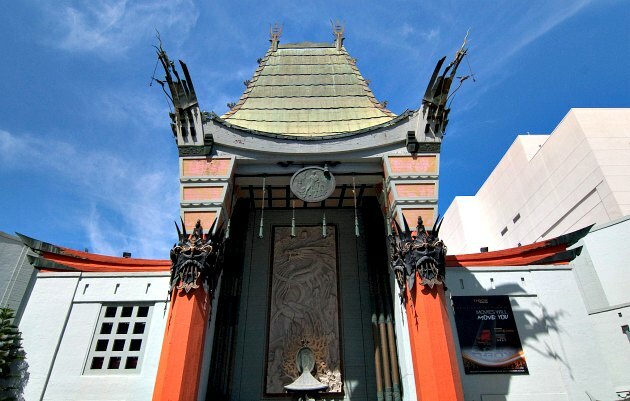 The other must-see highlight on Hollywood Blvd is still the Chinese Theater which is next to the new shopping complex. Chinese Theatre – Outside this fascinating ancient cinema on Hollywood Boulevard you’ll find the hand impressions of movie stars in the paving slabs. You can spend a long time just looking at them for free, but we’d recommend you take the tour of the cinema too. It was built in 1927, it’s still the home of many of the Hollywood premieres and it’s got a real story to tell. 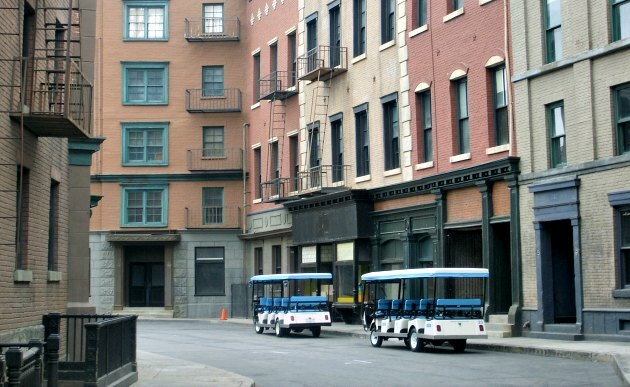 Warner Brothers – In our opinion, this is the best genuine studio tour you can do. No roller-coasters, just your chance to go behind-the-scenes at a working movie studio. You’ll see the “backlots”, the sets of films being shot at the moment, the scenery departments and even a little collection of movie vehicles like the “Batmobile”. Our guide was fantastic and whole thing was a real insight into movie making. It’s not cheap, but it’s worth it. Follow the signs from Warner Boulevard. You may need to take your passport with you for security. 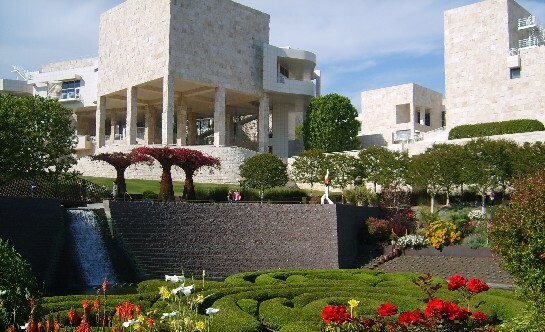 The Getty Center – This is an oasis of calm, high up on a hill with stunning views of Los Angeles. It’s an art gallery and café, but it’s also fascinating to walk around with beautiful gardens and striking architecture. Best of all, it’s free! Closed on Mondays. It’s signed from the Interstate 405 with the main gate on Sepulveda Boulevard. 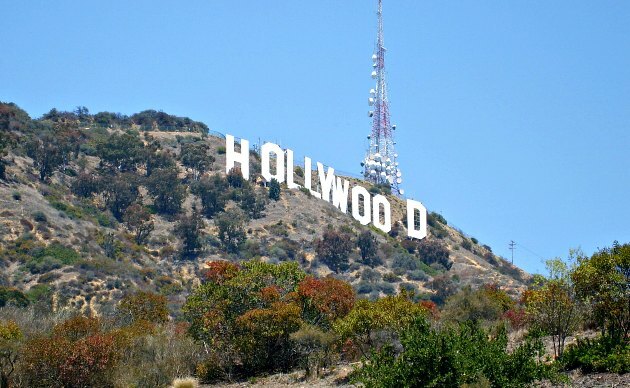 The Hollywood sign – You won’t find this in most tourist guides because you can’t get to the sign itself. We wanted a photo as close as we could get in a car though. The closest road to the sign is Canyon Lake Drive – click the link for the full directions. You’ll see a Dog Park so you’ll know you’re in the right place. Beverly Hills & Bel Air – These two areas are amongst the most exclusive in Los Angeles and the houses here are huge, luxurious and attractive. You can buy “star maps” in gift shops and from street sellers. These are great fun to follow around to see the houses of the rich and famous, but don’t expect to see the stars themselves! In most cases, you just get to see the gates to the houses, but we’d still recommend following a star map as it’s a great way to see the wealthy parts of LA. 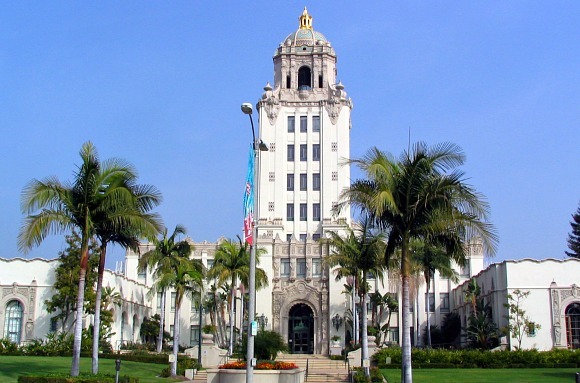 There are plenty of other sights to see too including Rodeo Drive with its exclusive shops and landmarks like Beverly Hills City Hall. Universal Studios – It’s basically a theme park with rides and attractions, but the twist is that the “Studio Tour” part does actually take you through the working studios and the “backlot”. 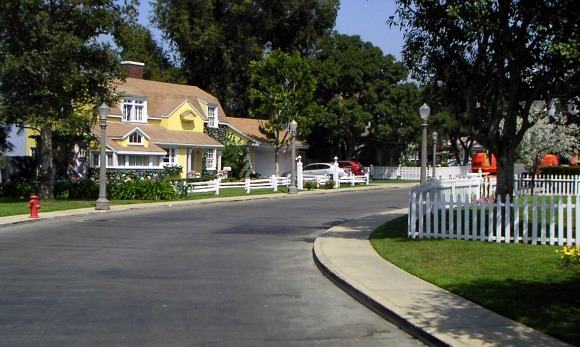 You’ll see the outside set for Desperate Housewives, the square used in “Back to the Future”, the plane crash set from “War of the Worlds” etc. Universal is signed well from Highway 101. You can book a range of tickets in advance and save money here. The Queen Mary – This ship is moored at the end of Highway 710 in Long Beach. If you’ve ever wondered what the Titanic might have been like, the ship will give you a clue. The Queen Mary is younger, but she’s a relic of the age of trans-Atlantic crossings and you get to walk around lots of the ship on a self guided tour. 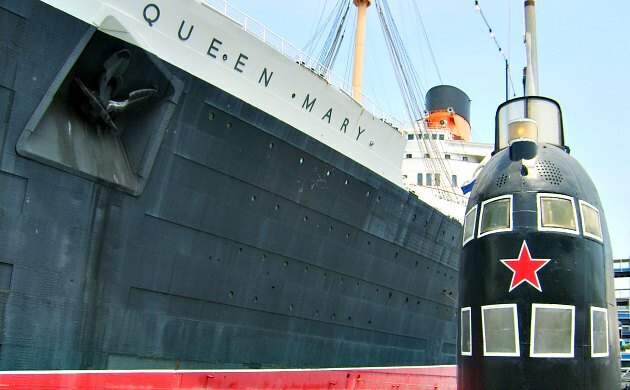 There are a range of tours and experiences on board the Queen Mary and the Russian Scorpion Submarine moored here too is fascinating to explore. 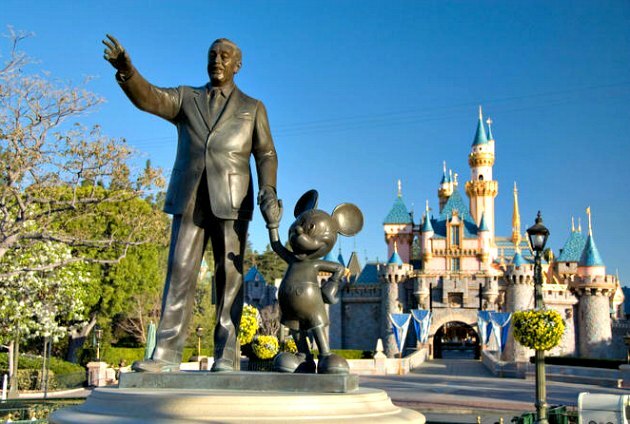 Disneyland Parks – Centred around the original Disney “Magic Kingdom” in Anaheim is an additional park called Disney’s California Adventure and a Downtown Disney complex. The main park is much smaller than the one in Florida, and the castle is tiny, but you have that feeling when you’re walking around that this is where it all began. Santa Monica – Not technically part of Los Angeles, but great for a laid back afternoon of shopping, eating and seeing the sea. You’ll recognise the Santa Monica pier because it’s been used in many a movie, although we wouldn’t recommend it at night when it becomes a hang out zone for local youths. The shopping/eating area though is a great place to be day or night and has a fantastic atmosphere. Take a walk along the beach path to see Muscle Beach or drive up the coast road (Highway 1) to see places noted for celebrity houses like Malibu. 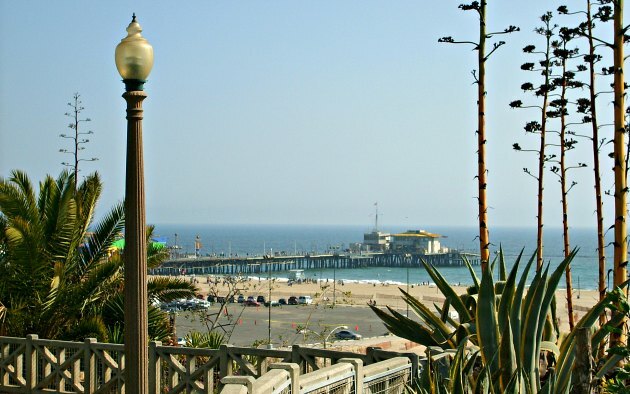 Also, as the sights of Los Angeles are all spread out and it doesn’t really have a centre, we’d recommend staying in Santa Monica and driving to all the places you want to go. 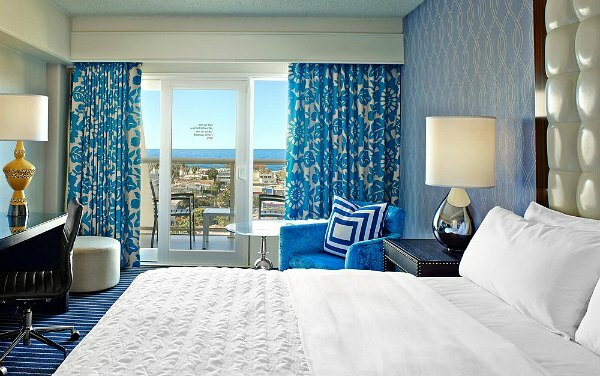 We stayed at the Le Meridien Delfina hotel in Santa Monica and thought it was lovely. Nicely furnished and decorated rooms, and a pleasant outdoor swimming pool. It’s about a 10 minute walk to the shopping area and 15 minutes to the beach. It also has parking, which many hotels in central Los Angeles don’t, but you do have to pay a fee. If you want to see the sights and get the most of out of LA, there’s not really any alternative to hiring your own car. Most of the main roads are wide and slow, but the highways are a bit scary at first. Take a good map or Sat Nav. Two down sides – the traffic jams on the highways and the parking fees! If you don’t have a hire car, click the Airport Transfers button for more options for getting from LAX.